To Try a New Sword on a Chance Wayfarer: Kuri analyzes (not so) Great Art: Vampire Jesus Strikes Again! Kuri analyzes (not so) Great Art: Vampire Jesus Strikes Again! 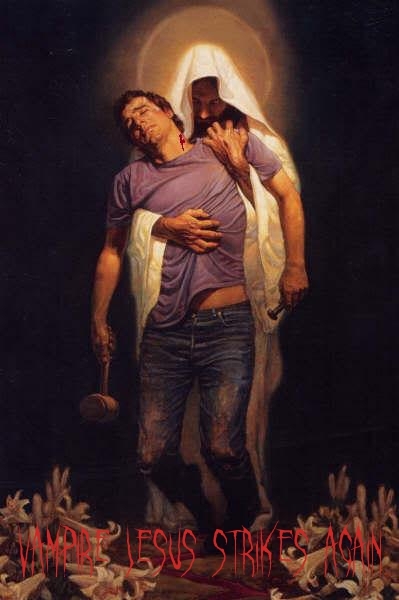 John thought that he could face Vampire Jesus alone, armed only with a hammer and a wooden stake, but Jesus was ready for him. John would be the first of his disciples, but he wouldn't be the last. Soon there would be 11 more, and Vampire Jesus would have a full coven of 12. And before you Christians get all excited about me "mocking Jesus," read this. Yeah, it does look like he just slipped him a rufie or something. But then, vampirism is a big sexual metaphor anyway. And in this case Jesus looks so sinister, and the neck angle is perfect. I think the idea is that we crucify Jesus every time we sin, but he supports us anyway. Something guilt-trippy like that.